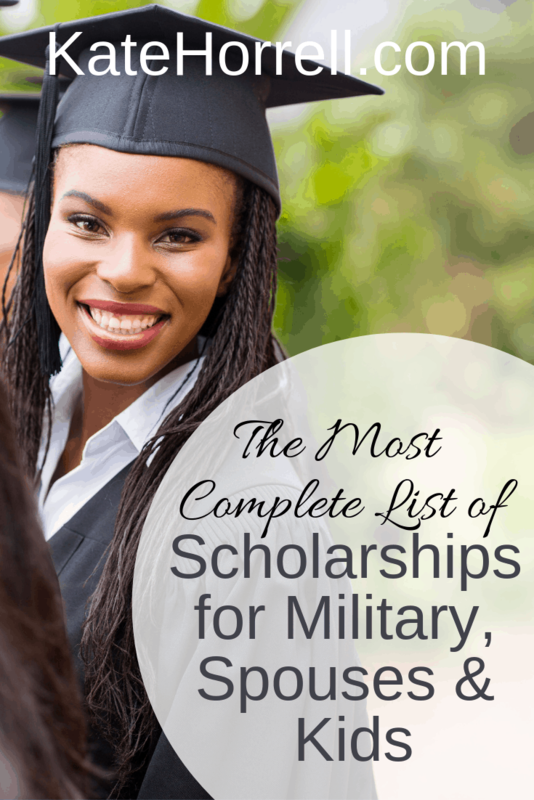 Welcome to a new series here at KateHorrell.com – scholarships and grants for military members and their families! I’m a couple of days late, but I didn’t want to skip April because there are some good scholarships and grants with April deadlines. I find new scholarships all the time, so be sure to come back throughout the month and see if there’s anything else for you! Description: Annual awards for graduating high school students that reside in or are attached to a base in the state of Rhode Island that are dependents of active duty, retired or deceased military personnel, and dependent children (other than high school seniors) in post-secondary education, certification, or professional programs, and spouses of RI active duty military personnel. adoptive child; or biological, step, or adoptive grandchild; or biological, step, or adoptive great grandchild of an FRA member. Description: You may apply for FRA Non-Member Scholarship if the applicant or sponsor is an FRA non-member, living, on active duty, reserve, retired, or honorably discharged veteran of the Navy, Marine Corps or Coast Guard. The applicant must be an FRA non-member; spouse; dependent biological, step, or adoptive child; or biological, step, or adoptive grandchild; or biological, step, or adoptive great grandchild of the FRA non-member. Description: The applicant must be a LA FRA or FRA member; spouse; dependent biological, step, or adoptive child; or biological, step, or adoptive grandchild; or biological, step or adoptive great-grandchild of the LA FRA or FRA member. Reserve Association or a FRA member in good standing at time of death, and served or is now serving in the U.S.
Navy as an enlisted medical rating assigned to and serving with the U.S. Marine Corps. Description: The American Legion Legacy Scholarship is a needs-based scholarship designed to fulfill a financial gap remaining after all federal and state educational grants/scholarships available to an eligible applicant have been utilized. Eligible students include children of U.S. military members who died while on active duty on or after Sept. 11, 2001 and children of post-9/11 veterans having been assigned a combined disability rating of 50 percent or greater by the Department of Veterans Affairs. Description: Current spouses or surviving spouses of a Uniformed Service member; Army, Navy, Marine Corps, Air Force, Coast Guard, (active duty, National Guard and Reserve, or retirees). Also the Commissioned Corps of the Public Health Service and the National Oceanic and Atmospheric Administration are included as eligible. You are NOT eligible if you are a current paid federal employee, an active duty or reserve member of the Armed Forces, the holder of an active securities license, National Military Family Association staff, volunteers, or representatives, already enrolled in any AFCPE® certification program, or if you have previously accepted the fellowship but did not complete the program. Description: Spouses, dependent children, and grandchildren of blinded veterans are eligible for the annual Kathern F. Gruber Scholarship and Thomas H. Miller Scholarship to assist them with their higher education tuition. The scholarships are awarded on the basis of merit through an application process that is evaluated by a committee. Description: Offered to U.S. Army veterans, including National Guard and reserve, in their sophomore, junior, or senior year of undergraduate education, or pursuing graduate education. Description: The Beardslee Scholarship is for Army Engineer Association family members and is awarded to four individuals who are spouses, sons, or daughters of Army Engineer Association members. Description: AMVETS has two scholarship programs. One is for veterans, active duty, and Guard/reserve component members. The other is for graduating seniors who are the child or grandchild of those groups. Description: Provides service members and veterans with the financial assistance they need to complete their educational goals without incurring excessive student loan debt. Description: Applications will be accepted from the spouses, children (natural and adopted), grandchildren and dependent stepchildren, under the age of 23 years (seniors in high school or above); of members in good standing in the USAWOA. Sponsoring member must have been a member of the USAWOA for a minimum of six months prior to the date of the application. All applicants must plan to attend, or continue their education, in an accredited American college/university, vocational technical institution on a full time basis. All must have a cumulative GPA of 3.0 or higher on a 4.0 scale. The school must be a degree or certificate granting institution. Description: High school seniors who are the children, grandchildren, or great grandchildren of soldiers who have served in the First Infantry Division of the United States Army, as well as children of active-duty soldiers of the division. Amount: up to $10,000 payable to the school in four annual installments of not more than $2,500 per year. If you have information about more scholarships, please email them to me at Kate at KateHorrell.com, with the word “scholarship” in the subject line. Together, we can find them all! Please let me know if you are awarded any of the scholarships you’ve found listed here at KateHorrell.com. I’m going to put together some sort of running balance!